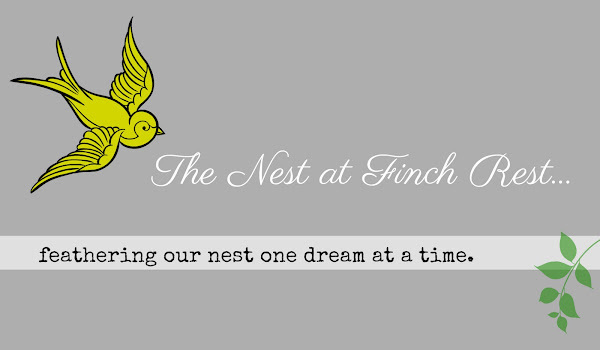 The Nest at Finch Rest: Thrift Side-Table Makeover! that I am actually beaming with joy writing this! Some of you may know about my weird aversion/fear of painting. Anything. Walls, nope. Furniture? Never. I just asked my daughter to do it. She laughed at me. I have had for years a fabulous wall painter named Margie. I shared her amazing faux finish in this old dining room tour post. I have another daughter who paints my real furniture occassionally. 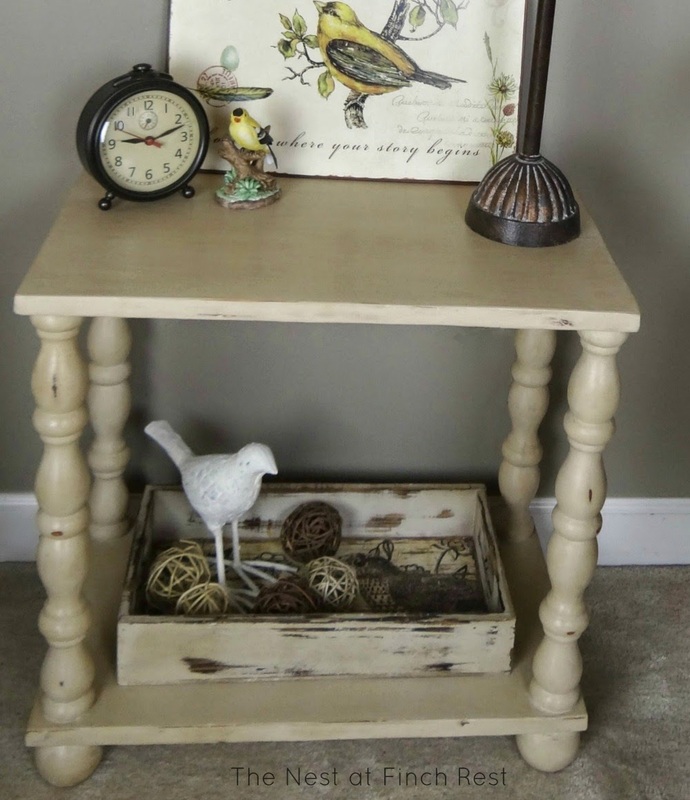 You can see an end table she painted here in a autumn tour post. But I am happy to say I think I am kinda getting over my fear. 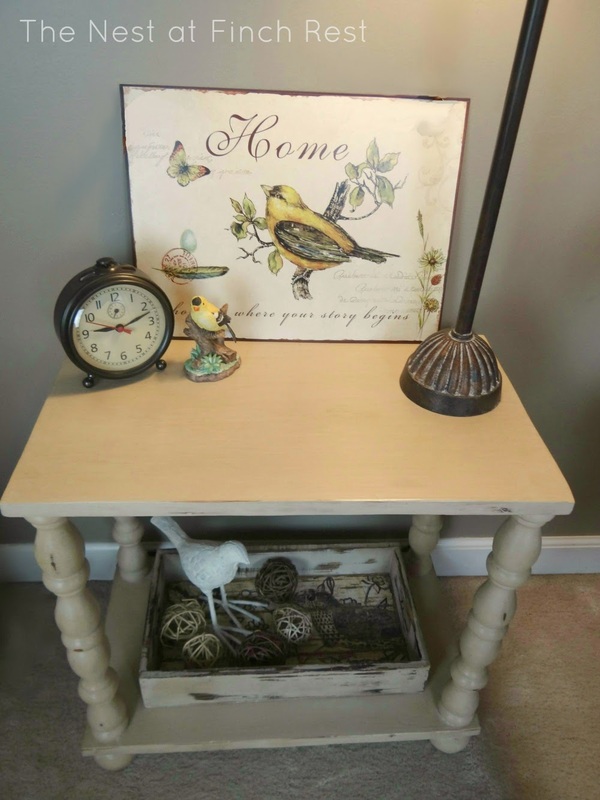 sweet little cheapie do-over side table! I bought it several years ago for only $15 at a Goodwill. I just loved it's legs, and that it has a lower shelf. but by golly I finally painted a piece of furniture! And I actually like it, maybe even love it! in our khaki aviary guest bedroom! of it's original reddish brown general bleckiness. and I believe I nailed it right on its beak! impressed with Lisa's amazing creations! Great job on the table, Michele. It works beautifully with your decor. You did a great job! I have a bit of a fear myself! I have 2 chairs very similar to the one next to your table...they both need painting...and reupholstering...but fear has me stiffed! Not so much the painting...but what fabric...what color...and how long will I like it before I want to change it again...so I haven't touched them yet! I hate that..wish I wasn't so indecisive! So what are ya gonna paint next? My hall foyer cabinet! Then my makeup table, then - oh my gosh - maybe maybe maybe my huge armoire - not sure, may need a pro on that one! Keep smiling. So cute and such a brave artist. I am so impressed not only with the table which is certainly looking delightful and matches the beautiful décor of the room it is in. I am impressed that you were able to overcome your fear, now that takes real guts well done you! It looks wonderful to me. Great match and job well done. Lovely Michele!!! It looks fantastic and you have every reason to be proud. I had no idea you were afraid to paint. Now that you have one great project under your belt, we'll be expecting to see many more transformations. 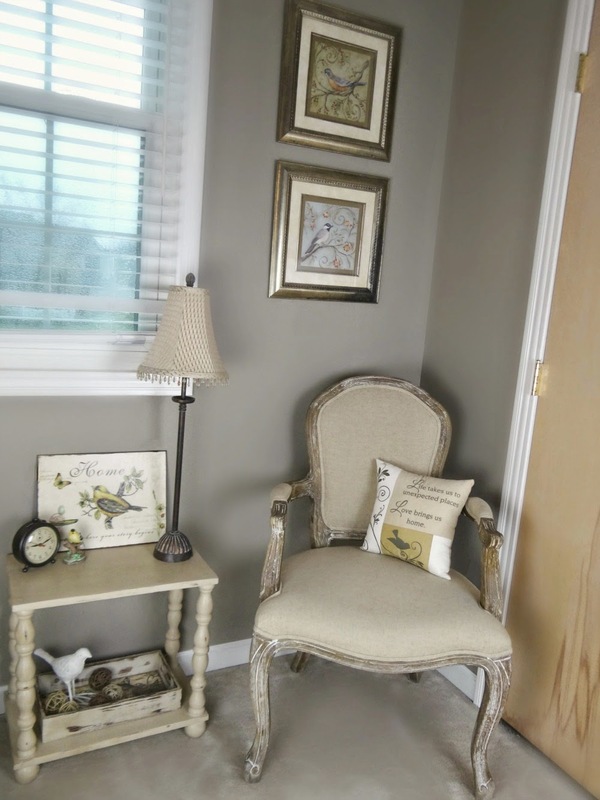 Again - great job - looks wonderful with your guest room decor. I get the fear and aversion completely! I have the hardest time, too, because I'm a furniture refinisher. Sometimes, though, you just want a painted piece. This table is perfect! I just painted one myself and am still iffy on it. I haven't distressed it, and I love yours. You did a great job, Michele! It turned out wonderfully and I'd say you nailed the color you were trying to match! fabulous redo, michele! no one would ever know it's your first! 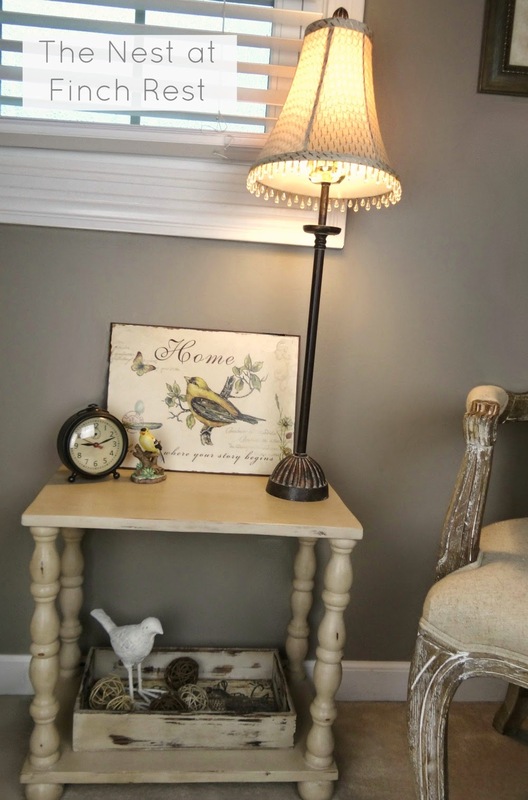 LOVE your side chair--the whole corner is adorable! Oh oh, your inner painter has been unleashed! LOL The table looks great Michele and it is right out where everyone can admire it. It turned out wonderful! I love that chair beside your sweet table too! Wow! Congratulations for taking that first step, and your project looks amazing. Little tables of "just the right size" are so hard to find, and how cute it is now that you painted it. Love your table. the color could not be more perfect match to the chair. It looks great! It matches your tray perfectly! You did a great job, Michele...cute, cute table. You did a GREAT job on this, Michele. I love it and once you get started you will be painting everything in sight! LOL It matches the tray perfectly! Warning: You are now officially a furniture painter. You will be forever hunting for that next piece to redo. Seriously good work! It is lovely! Love the legs & the color. Such a pretty corner you have there! 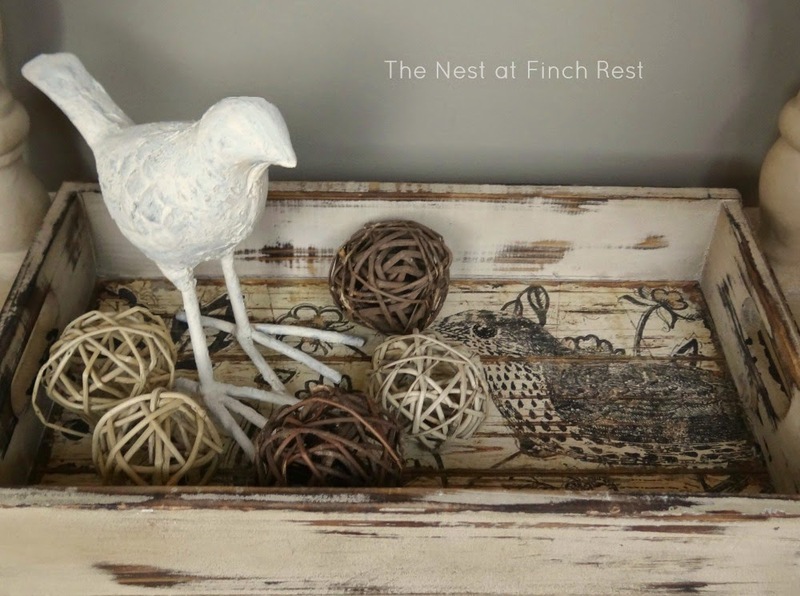 Painting furniture is instant gratification fun for me - a smaller piece like this anyway! You did a great job on this, Michele! I love the color choice and how you used the piece in the room! Thanks so much for stopping by my blog and for your nice comment! Good for you girl! It turned out fabulous. Love how you have decorated it too. I have had very little time to visit lately, but you were on my mind. Happy week! The table is beautiful! You did a fabulous job...and now, I just know there's more furniture painting in your future! Love all the bird decorations and your overall "look". You did an awesome job! I bet there are a lot of painting projects in your future! Wow, you did a great job. I now feel motivated to try my own little project. Look at you! You did a wonderful job on that darling table! It just looks perfect! Now that you're over your phobia I'm sure you'll be wearing out your paint brushes! ;) Oh, lucky you getting to spend the summers in Mystic! I'll bet it's gorgeous at time of the year! Thanks for popping in and I'm sure you could have given a better tour than me! Not summers - just quick visits - it was my SISTER who spent summers there....I just got lucky enough to go a few times - never long enough, though! I would looooove to go back again. I love this! These are the exact colors me and my husband are going for with our house! I think you did an amazing job! This looks just like something I'd see in a pretty catalog! I can totally relate to your aversion/fear. I'm trying to work up my courage . . . but you did a beautiful job! It looks fantastic, and goes so well with your chair! Congratulations Michele! Congrats Michelle, you did a marvelous job my friend! Yeah, I can relate with your fear, I still have it, so I haven't starting painting any furniture YET, lol! I love how you arranged it next to the gorgeous chair! Have a lovely weekend ahead. Well aren't you a clever girl then !! Hello honey, long time no speak. Just popping in to blogland to say hello to my special bloggy friends. I rarely have time for my blog now as I have started my own florist business. If you fancy popping over to my Facebook page (do you have fb? 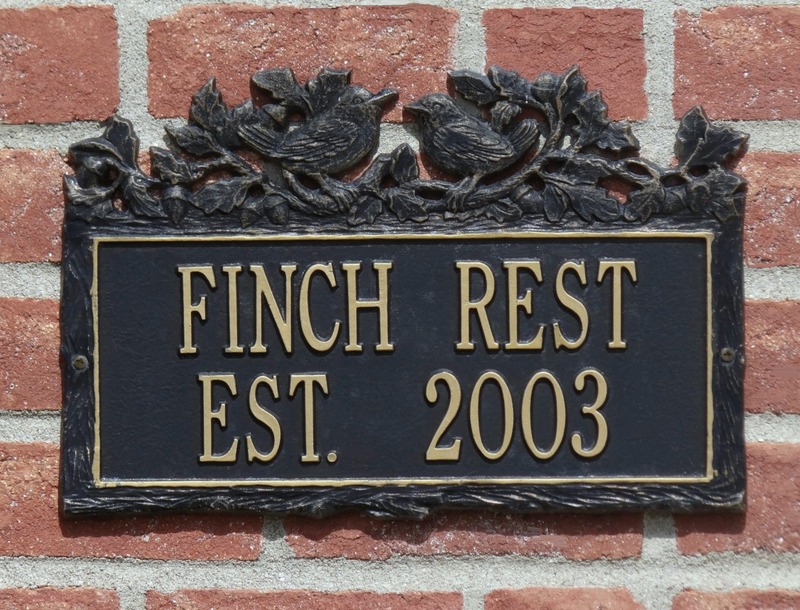 ), you will find me at MAYFLOWERS VINTAGE FLORIST. I would love to show you what I have been up too. I adore your new masterpiece and I love that little corner of your room ! Clever you !!! OMG my friend, I'm so PROUD OF YOU!! I'm going to try to comment, so many times I have wanted to respond but as you know I don't have a blog. Michele that turned out sooo beautifully!! I have that bookcase in the my back living room that is awaiting your talent the next time you come for a visit ha,ha. Is that the paint you got when you were here in Noblesville? All you blog friends are so SWEET, I love how you all encourage one another. Have a tea-rific day my special friend, Love you, Mary D.